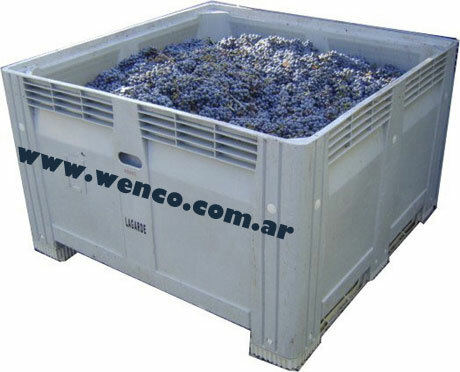 A004 Pallet Box size 1220 x 1220 x 770 mm » WENCO S.A. Uses: Wenco has in stock new plastic pallet box of polypropylene (PP), size 1220 x 1220 x 770 mm. They are available in both solid and perforated versions. Pallet box is a container used for transport and storage merchandise of big dimensions. 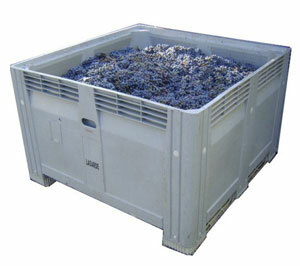 Our bulk containers are built to meet the most rigorous demands. Pallet boxes are used for harvesting, shipping and storing fruits, vegetables and other; these large pallet boxes are made with virgin plastic and have rounded corners and smooth surfaces that deliver fewer scuffs, bruises and cuts on your product. Their high-impact resistance and self-palletizing construction help keep their shape and stand up to heavy day to day use. Hygienic, strong and stable, our pallet boxes offer a robust packaging system which can be used again and again.